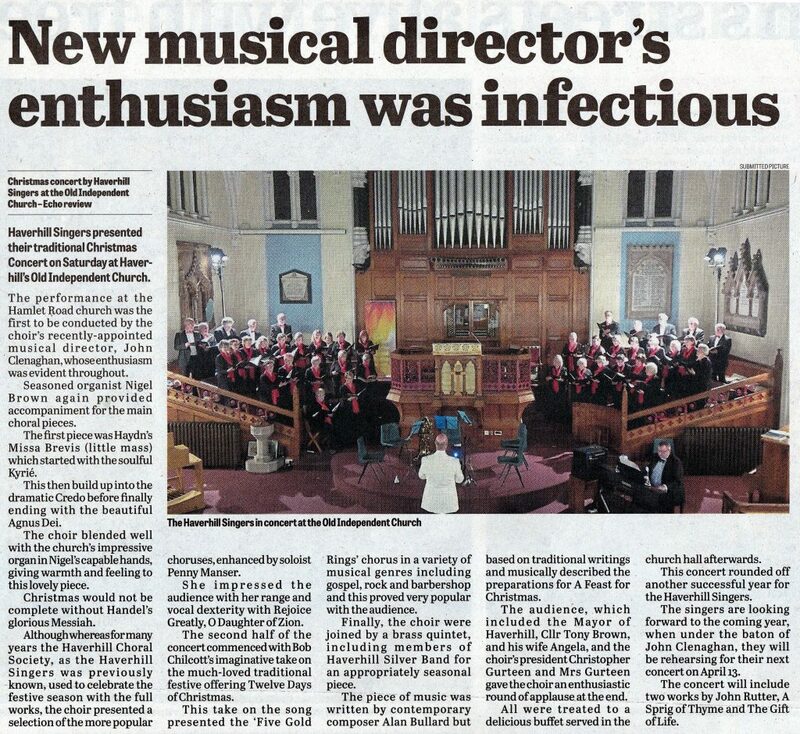 Haverhill Singers are very pleased indeed to welcome our new Musical Director, John Clenaghan G.Mus, who joined us in September 2018. Graduate Diploma in Music from Colchester Institute School of Music where he studied singing and piano, and was twice winner of their Mixed Instrumental Ensembles Competition. John has experience of conducting choirs of various sizes, with and without orchestras and experience as MD for Musical Theatre. He has excellent sight-reading skills and is a sensitive accompanist. He also produces rehearsal CDs for individual vocal parts, (which are extremely useful for practice at home) and also bespoke choral arrangements. John succeeds Jane Wright who was our Musical Director for fifteen years and we are sure he is keen to build on the fine work that Jane did over the years with the Haverhill Singers. We are also very pleased to welcome back, after a break,Ian Davison as our rehearsal accompanist. Having Ian with us is a double bonus as, besides accompanying, he is an excellent singer and joins the tenor line at concert time. Haverhill singers were joined by around 20 singers from other local choirs in the Old Independent church, Haverhill for a very enjoyable afternoon. Three works were rehearsed -Faure ‘Requiem’ and ‘Cantique de Jean Racine’ and Mendelssohn ‘Hear my Prayer’ which were later performed in an informal concert. Soloists were Lynn Kowalski (soprano) and David Hart (baritone). Accompaniment was expertly provided by Nigel Brown playing the magnificent Binns organ. Nigel also played a light-hearted solo, ‘Sortie’ by Lefébure-Wély. The whole event was directed by our guest conductor, Edward Dodge. We were pleased to meet some old choral friends again chat over tea and biscuits. We hope our visitors enjoyed themselves and that we will see them again at future events. Haverhill Singers are staging a ‘Come and Sing’ event on Saturday 30th June 2018 as part of the Haverhill Festival. Our Guest Conductor will be Edward Dodge who was our MD for fifteen years and accompaniment on the magnificent Binns organ will be by Nigel Brown. The venue is the Old Independent Church, Hamlet Road, Haverhill CB9 8EF. Dress is smart casual and scores will be available for a £2.00 deposit. Tea/coffee/orange juice and biscuits will be provided. Please provide your own sandwiches/snacks for the break between the rehearsals and concert. If you have not sung in a choir before, or haven’t sung for ages, come along and join us in a friendly informal atmosphere for an afternoon of lovely tuneful music. We have begun rehearsals for out next concert, ‘Petite Messe Solennelle’ (Rossini) which will take place on Saturday 28th April 2018 at the Old Independent Church in Haverhill. Although a Mass, this is a tuneful and dramatic work from the pen of the composer of thirty nine operas. It also has the unusual accompaniment of piano and harmonium! If you enjoy singing and would like to join us please contact us via our ‘Contact Us’ link. Auditions are not required. Give it a go! We would love to meet you.